On this week’s AtlantiCast, Fortune Magazine recognizes a decade of excellence at Atlantic Health System! Plus we take you inside Morristown Medical Center’s new hybrid operating room and learn how we're helping students live healthier lives. 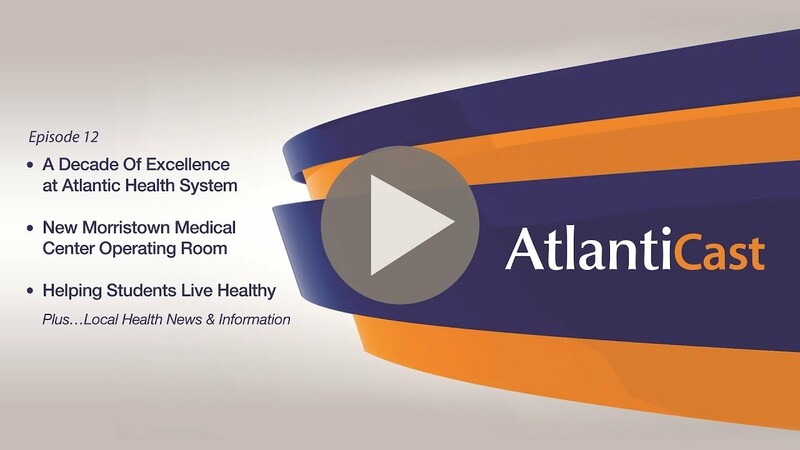 - This week on AtlantiCast,0:02a decade of excellence for Atlantic Health system. learn how Atlantic Health is helping local students0:11live healthier lives and much more. one of the 100 best companies to work for. The list is compiled through surveys. who filled out those surveys. and each other are inspirational. visit Atlantic Health on Facebook. when it comes to heart valve replacement. when it comes to providing seamlessly integrated care. along as with Atlantic home care and hospice1:45and other departments called Epic. to deliver patients the best possible care. and get answers to their healthcare questions. at anytime, anywhere improving care and efficiency. and schools are a big part of any community. to embrace healthy lifestyles and habits. such as diabetes, obesity and heart disease. and school supplies and events like physical activity fairs. you're looking at on that cake. on our Facebook page Atlantic Health Specialty Care. by way of Morristown Medical Center. and Hurricane Maria.3:42They found a place to stay in New Jersey with relatives. And Pedro tried to find a way to resume his studies. 3:56but got to participate in the delivery of his own son. to put his lessons to use healing the population there. for wear red day on February second. thanks to everyone who participated in this great cause. the creation of the scoliosis and spinal deformity center. Dr.Jason Lowenstein is the director of the center. or two about how the center is able to help folks4:57with these conditions. for both children and adults. We have amazing physicians and surgeons in the center5:08and really state of the art technology to offer5:11comprehensive care to these patients. enable the center to do this important work? by both the Joint Commission and US News and World Report. you can go to AtlantiCast.org.